This colorful spring salad plate is both light and filling. 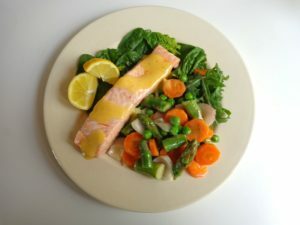 Steamed salmon is placed on a bed of tender greens, accompanied by a mixture of spring vegetables bathed in lemony homemade mayonnaise — a modern version of the French dish macédoine de légumes. Either fresh or frozen salmon may be used in this recipe. If using frozen salmon, defrost it before beginning. The veggies should of course be fresh. I used a mixture of asparagus, young carrots, peas and red spring onion, but you can improvise according to what’s available. Baby turnips would work well, for example, as would green beans or finocchio. For best results, by all means make the mayonnaise yourself. It is quite easy and takes only five minutes or less. The recipe and ingredient list can be found here. For maximum flavor serve this salad at room temperature, unless it is a very hot day. The quantities below will serve two people. Begin by making the mayonnaise. Click here for the recipe. Quarter the lemons and squeeze one quarter into the mayo. Stir to blend. Rinse the asparagus and chop the spears into bite-sized morsels. Peel the carrots and slice into rounds. Peel the onions, slice in half and quarter the halves. Shell the peas. Fill the bottom of a steamer with water and set the basket on top. Add the asparagus, carrots and onion. Cover the steamer, turn on the heat and watch the pot. You are aiming for veggies that are cooked just enough to be tender. Count 3-4 minutes from the time steam begins to escape, then add the peas, cook for one minute more, turn off the heat and remove the cover. Transfer the veggies to a mixing bowl. Sprinkle with salt. While the veggies are still warm, add 4 tbsp. of mayonnaise. Stir to blend. Now place the salmon in the steamer and cook for about 5 minutes. Test for doneness with a fork. If the salmon can be pierced easily, it is done. If not, cook for another minute or so. Open the steamer to let the fish cool. Place a handful of greens on each plate. Top with the salmon and veggies. Add the lemon quarters. Drizzle some mayo over the salmon. Take the extra mayo to the table. Serves two. If you don’t have a steamer you can boil the veggies and poach the salmon. Cook for the amount of time noted above.